The late Father James Kelly died flying the mountain pass between Dillingham and Togiak March 23, 2002. That is the first thing I thought about when I flew that exact same mountain pass yesterday, for the first time, January 26, 2010. I have avoided learning the complex route through the mountains from Dillingham to Togiak for that very reason. I will admit, I am a little afraid and a bit hesitant when I think about that perilous route. Entrance to the Togiak mountain pass 12 miles West of Dillingham. I have flown to Togiak several times but I always either flew over the top of the mountains or around them. 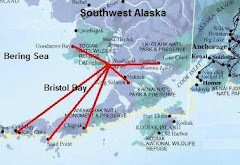 After giving Robert, a Native Alaskan pilot from Penair in Dillingham, my Garmin GPS 550 to mark all of the waypoints along the twisty pass, I decided it was time to fly it myself. I took off on a perfect day. The sun was not yet on the horizon at 9:30 AM. The sky was as clear as a bell. The white snowy mountains stood out majestically against the lightening sky. I flew toward the first waypoint Robert plotted on my GPS and leveled out at 1000 feet. I chose a nice day to fly the pass because my mission was to test the waypoints Robert entered into my Garmin so that I can rely on them 100%. If I ever get stuck in bad weather flying through those mountains I want to know where these waypoints take me. As doubting Thomas would say, "I need to see and touch the nail holes." Flying west through the mountain pass I approach the CHUTE. Robert marked both the East entrance (seen below) and the West entrance for me. West bound I arrive at Horseshoe and start to make the turn which will bring me to the last leg of the flight before I reach Togiak. Runway 03 in Togiak looms in the distance. On final for runway 03 in Togiak, Alaska, I took one last picture before flying the pass again back to Dillingham. To reach Togiak the total flight took about 35 minutes or 60 miles. Flying East bound toward Dillingham I took a shot of Summit, the highest point in the pass. It takes about 700-800 feet to clear Summit. The Funeral for Jacqueline Dee Grediagin, the sister of JD Bennis, was January 19, 2010. Jacqueline was born September 6, 1964 and died January 13, 2010. During the middle of winter, preparation for a funeral is tremendous, especially when the temperature is hovering around zero. There was a couple feet of snow on the ground and it had to be cleared before the Bennis family could start to dig Jacqueline’s grave. Friday, January 15th, shortly after hearing of the death of his sister, JD Bennis plowed the road leading to the Holy Rosary Cemetary and then cleared away snow from the grave site. 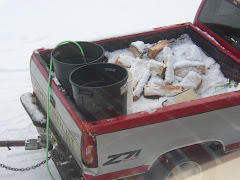 When the ground is frozen, special equipment has to be brought in to break it up and dig it out. The Bennis family and friends arrived early Monday morning, while it was still dark outside, to begin the process. Here are a few pictures. Family and friends of Jacqueline begin to gather in the dark at Holy Rosary Cemetery. They have a big job ahead of them. The heavy equipment is set up. JD Bennis and a friend inspect the progress of the breaking up of the frozen ground. The machinery continues to break up the ground before it can be scooped out and loaded onto a large ground cloth. Jacqueline’s body had to be flown in from Anchorage on Evert's Air Cargo. 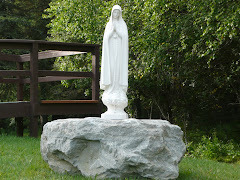 She arrived Monday Morning while the Bennis family was digging the grave site. 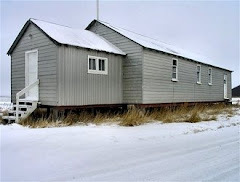 They went to the Dillingham Airport about 10:00 AM and loader the casket into the back of a Toyota pickup, then drove the short quarter mile to Holy Rosary parish, backed up to the church, and unloaded the casket onto a casket stand, which was ready just inside the church doors. Below, the casket is moved from the back of the pick-up into the chruch. The following is the program used for Jackie's Funeral Mass. Please click on the picture to make it larger. After the funeral Mass, mourners line up for the short procession to the Holy Rosary Cemetery. The processional cross went first, carried by Josh our altar server, then came me, then the casket, the family was next, then the rest of the mourners. Jacqueline's body is then carried and rested on the planks over the grave. The ropes are threaded through the sides of the casket, the planks are pulled out, and the casket is slowly lowered into the ground. After the grave side service (the sprinkling of Holy Water to bless the grave site and the prayers), Esther throws the first handful of dirt into the grave. The pallbearers offer a shovel full of dirt as mourners approach. It is customary for everyone to throw a handful of dirt on the deceased. People chip in and cover up the grave. Afterward a potluck was held at the Senior center. Our prayers go out to the family and friends of Jacqueline Dee Grediagin. May she rest in peace! Tucker Aviation heads for the mountain pass a couple miles out of Dillingham. 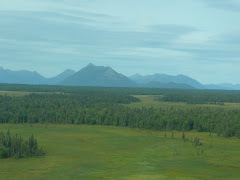 Normally when flying to Togiak I wait for a clear day and climb to 4,500 feet and fly over the top of the Ahklun Mountains. The highest point in the range is 5,000 feet. Other times I follow the coast around and hope my brief cut through the mountains well not dead end into an impossible turn-around situation. No more. I finally have the GPS coordinates through the mountain pass safely saved on my new Garmin 550 touch screen GPS. I took my new Garmin 550 to Robert. 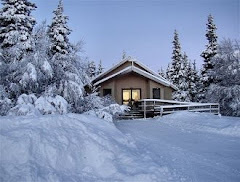 Robert is a native Alaskan who grew up in Manokotak. 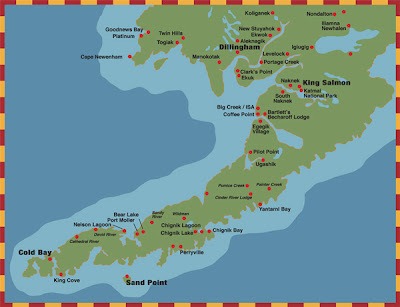 He has the most seniority of any Penair pilot stationed in Dillingham and has flown over 20 years in this area. Here is Robert after landing in King Salmon Sunday, January 10, 2010. Robert plotted out the points on my GPS January 14th, 2010, on his daily run through the Togiak Pass. He marked seven waypoints from Dillingham to Togiak. These waypoints are invaluable to VFR pilots who fly regularly in this area. Tucker Aviation approaches the first waypoint on the eastern side of the pass. When the weather goes down, one can fly the pass at 500 feet if needed. There is only one point where the VFR pilot must climb to about 750 feet. Robert called that point Summit. Since Robert was not use to the new touch screen 550 Garmin GPS, some of the letters in the names of the waypoints may be, well weird. 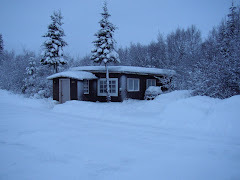 For example NKMOHILLS might be NAMOHILLS. The type in alphabet on the touch screen takes some getting use to. Each waypoint below is a major point on the way through the mountain pass from Dillingham to Togiak. The total trip is 60.9 miles. I had my GPS in simulator mode when I took these next pictures. I used a digital camera and took a picture of the GPS screen. The Terrain map in this Garmin 550 is very detailed when actually flying the route. I used the terrain map when flying through Lake Clark Pass last week. I hope to fly this Togiak mountain pass in the next few days. So, since Robert mapped it out, I have not flown it myself yet. Here is the terrain map, which is very helpful when flying through mountains. With the finishing of a new room, Saint Theresa is inviting any priest who would like to take a private self-directed retreat, to think about Saint Theresa. 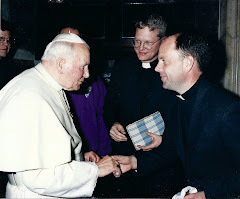 All that is needed is verification that the priest is in good standing with the Catholic Church and is willing to celebrate the one Mass we offer each week, which is Sunday at 9:00 AM. The newly built room took the place of the original sleeping arrangement, which was a fold-out bed in the south end of the church basement. 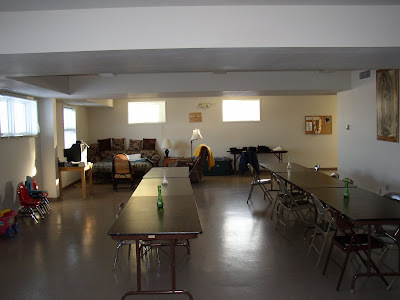 A new private room was completed in December of 2009 and is located in the north end of the church basement. 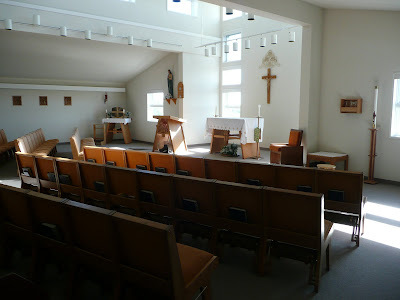 Here is a work in progress picture of the New Priest Retreat room. Closet doors still need to be intalled. New furniture was ordered and set up in the recently built 10' by 12' room. The new room has a view! There are four main reasons Saint Theresa would be a great place for a quiet, peaceful, and spiritual self-directed retreat. 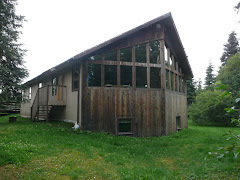 First, its location takes full advantage of views of lakes, tundra, and mountains, making for a spiritual and serene environment. 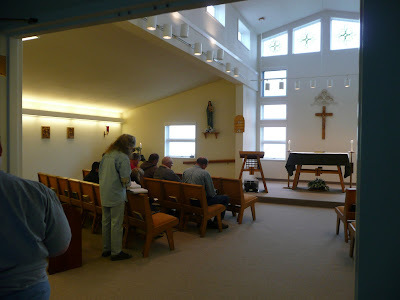 Second, staying in the basement of the church would allow easy access to the Blessed Sacrament and the chapel. 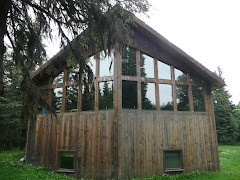 Third, the accommodations are great for a remote church in the middle of the Alaskan Bush. 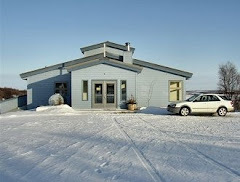 They include a kitchen (stove, fridge, etc), room, telephone, DVD/TV player, shower, running water, and use of a Subaru. 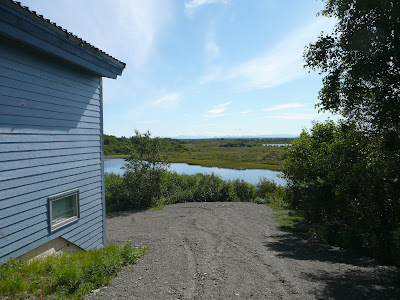 There is internet access in the library at Naknek and grocery shopping in the two small villages. Fourth, the church is normally used only once a week for Mass, which is every Sunday at 9:00 AM. This could truly be a silent retreat if wanted. 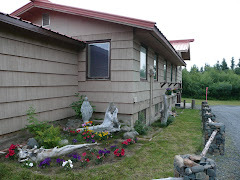 So, if you are ready for a peaceful retreat, you love adventure, and would like to experience the Alaskan Bush first hand, then send us an email or give us a call and arrange for some spiritual nourishment! Trevallian, whom the Clarks Point Community calls “Alex” was baptized on the kitchen table in Louise Gardener’s home June 20th, 2008. The “St. Anthony Messenger” (based out of Cincinnati, Ohio) used the picture in their magazine (http://www.stanthony.org/). Effie Caldarola, from Anchorage, wrote the story. Here is that picture taken 20 months ago that was used in the Magazine. 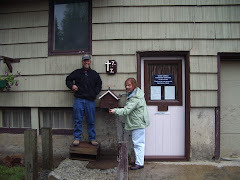 The magazine was read by a woman back East and that same magazine ended up as a gift to the mother in Clarks Point, Alaska. Here is how that happened. Here is Justine and the now 20 month old Alex holding up that magazine. Justine helps Alex put up some of the pieces of the Nativity Puzzle. 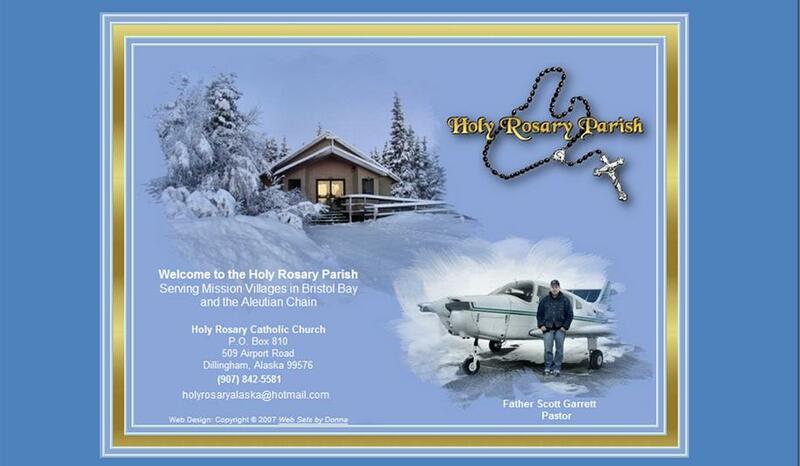 Thank you St. Anthony Messenger for your coverage of our Alaskan Mission.